Repetitive overuse of the psoas is a common yet under appreciated cause of mobility impairment in the dog. 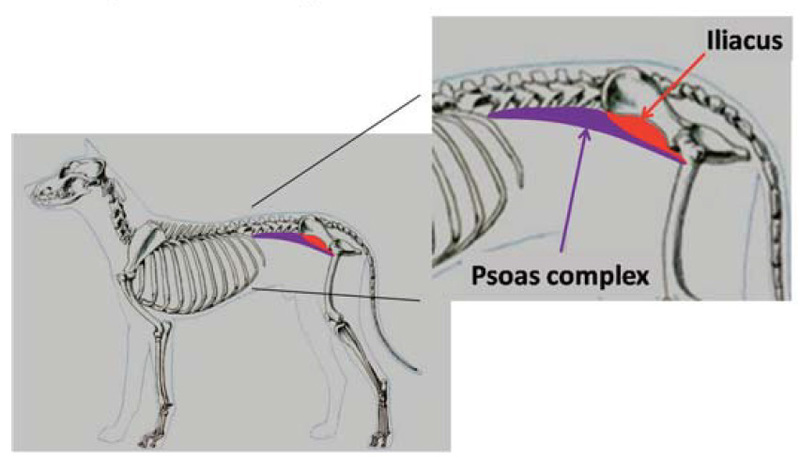 Sustained contraction, fatigue and spasm of the psoas musculature frequently develop in dogs with a wide range of orthopedic or neurologic disorders as they alter their posture to compensate for painful or dysfunctional limbs. This form of repetitive strain injury (RSI) can be difﬁcult to recognize, yet it is a signiﬁcant cause of pain and decreased mobility, especially in geriatric dogs. Strain-counterstrain is a manual therapeutic technique adapted from the ﬁeld of physical therapy that can be used to treat psoas muscle strain that develops secondary to injury or surgery. It is also a useful method for preservation and enhancement of mobility in older dogs suffering from chronic progressive degenerative joint disease. 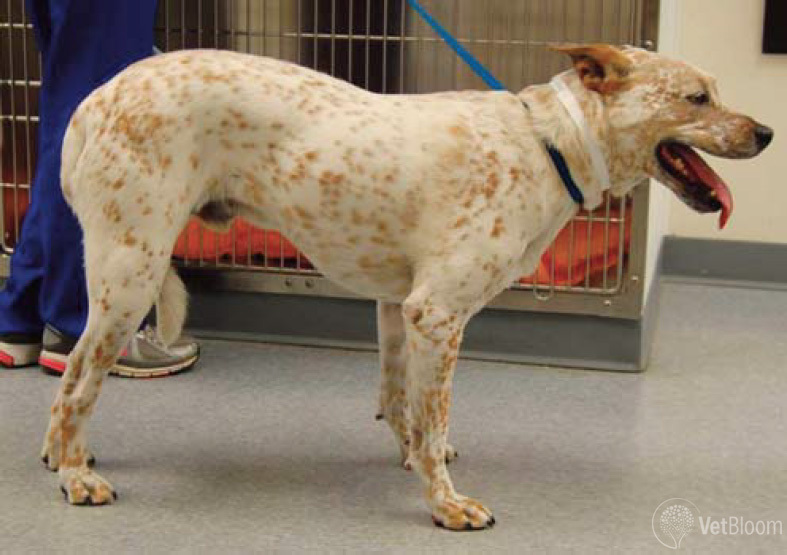 This article presents an overview of the pathomechanics, diagnosis, and management of psoas RSI in dogs. The musculoskeletal system is highly interconnected and functionally integrated, and injuries or disorders affecting any one part of this system often lead to secondary problems and malfunction at other sites. For example, the limp that develops in humans following even a mild ankle sprain can lead to ﬂares of secondary lower back pain due to changes in posture and body mechanics at the level of the hip and spine. Physical therapists have long recognized the deleterious changes in posture and movement that develop in humans in response to speciﬁc injuries or orthopedic disorders, and a major goal of physical therapy is to limit this “ripple effect” of secondary pain and dysfunction. Dogs also adopt compensatory postures and patterns of movement in response to injury or orthopedic disease, and these changes in basic body mechanics can also lead to problems at distant sites. One of the most common examples of this is psoas RSI that develops in association with pain and dysfunction of a hindlimb. Fig. 1: This dog shows classic hind limb off loading posture. Note the elevated pelvis, low head position, and lumbar roaching. 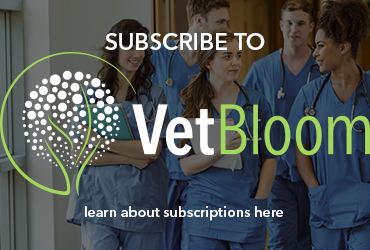 Hind limb lameness is the most common form of mobility impairment in the dog. Disuse or ofﬂoading of a hind limb results in several characteristic postural changes including low and extended head carriage, elbow abduction, sloping of the topline with elevation of the pelvis above the level of the scapulae, and hunching or “roaching” of the lumbar vertebral column into an abnormally kyphotic conformation (Fig. 1). These adaptive changes are designed to shift a dog’s center of gravity towards the forequarters and ofﬂoad the hind limbs. Lumbar roaching is a consistent postural adaptation to hindlimb lameness; the psoas musculature is one of the primary structures responsible for maintaining the lumbar spine in a roached position. The psoas system consists of several muscles that originate along the ventral aspect of the cranial lumbar vertebrae and that insert on the pelvis and proximal femur. The major component of the psoas system is the iliopsoas, which inserts on the lesser trochanter of the femur (Fig. 2). The iliopsoas is an important ﬂexor of the hip. The psoas system as a whole also functions to ﬂex the lower spine and draw the pelvis forward under the body. Such lumbar ﬂexion occurs normally during certain gaits such as the gallop. However, in response to hind limb lameness, the psoas musculature is recruited into a postural role and undergoes sustained contraction to maintain lumbar ﬂexion. Fig. 2: Illustration of the basic anatomic location of the psoas muscle system. Two forms of psoas muscle injury are recognized in dogs. The classic form is a sprain of the iliopsoas at its musculotendinous junction. This is usually a painful traumatic injury. Iliopsoas sprain is common in sporting dogs and is often associated with high-intensity activities that subject the hip to forceful extension, such as hard running or certain agility exercises. In contrast, RSI is a more insidious form of injury that is uniquely associated with postural adaptations to hind limb lameness. RSI refers to a syndrome of muscular pain, spasm, and diminished strength that occur as a result of repetitive activity or constant sustained contraction. In dogs with painful hind limb disorders, persistent forward weight shifting imposes a high work load upon the psoas musculature, and leads ultimately to muscle fatigue and RSI. The psoas muscle is predominantly a fast-twitch muscle, and as such is adapted to cycles of transient forceful contraction and rapid relaxation. As forward weight-shifting posture becomes a chronic condition, the ﬁber type distribution within the psoas musculature will transition from primarily fast twitch muscle ﬁbers to a combination of slow and fast twitch ﬁbers (adaptive ﬁber type switching). However, despite this adaptation, the ability of the psoas to function as a postural muscle remains limited. Psoas RSI is often a clinically subtle condition and may manifest as stiffness after rest, difﬁculty rising, reluctance to climb stairs or jump into a vehicle, and general exercise intolerance. Some dogs with this condition exhibit pain on deep palpation of the musculature of the groin; however, more commonly, pain is localized to the mid-body as well as the origins of these muscles on the transverse processes of the third and fourth lumbar vertebrae. This form of strain injury does not cause structural abnormalities within the muscle. Thus, radiography, computed tomography, and MRI of affected muscles are invariably normal. Diagnosis of this condition is based on physical examination and identiﬁcation of regions of tight and painful muscle (trigger points) within the psoas system. Psoas RSI can be difﬁcult to recognize and the pain and dysfunction associated with this condition are often attributed to the primary cause of a given hind limb lameness. For example, psoas RSI is extremely common in dogs with hip dysplasia. 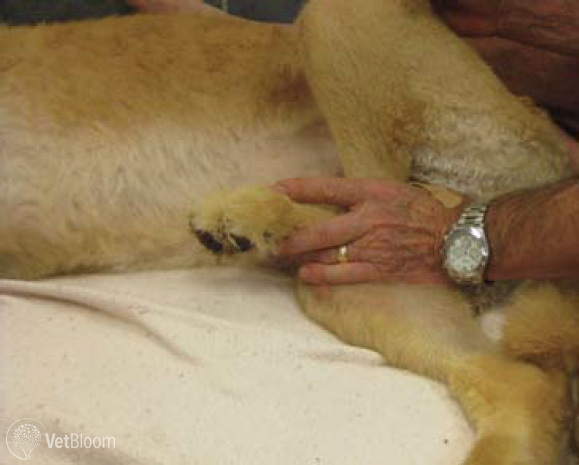 Hallmark clinical features of hip dysplasia include stiffness and pain on extension of the hip joint. However, this movement also stretches the psoas musculature; thus, resistance to hip extension may reﬂect pain both at the level of the hip and the muscles of the lower back. Recognition of these interconnected problems is important since the most effective treatment strategies are those that address both conditions simultaneously. Standard approaches to the treatment of psoas RSI have not been established. In all cases, the primary cause of a given hind limb lameness should be addressed if possible. However, this is often difﬁcult in older dogs, especially those suffering from progressive osteoarthritis of key joints such as the hip, stiﬂe or tarsus. In such cases, treatment of psoas RSI can nevertheless be of value in enhancing the ability of a dog to compensate for ongoing joint degeneration. Fig. 3: Strain-counterstrain maneuver, a manual therapy technique for treatment of psoas strain injury being performed on a dog. Strain-counterstrain is an established manual technique used by physical therapists for treatment of a wide range of human muscle strain injuries. 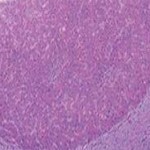 It is an emerging approach to the treatment of psoas RSI in the dog. Muscles affected with RSI become hyper-responsive to elongation and when stretched, undergo vigorous and painful reﬂexive spasm. Strain-counterstrain involves manipulation of a portion of the body into a position that maximally shortens a strained muscle. This position is held for a brief period before the body is allowed to gently return to a neutral position, and the process is repeated several times. Cyclic passive shortening of a strained muscle resets the level of tension in the muscle through modulation of the afferent signaling of the muscle spindle apparatus to the central nervous system. With time, this recalibration of tonic muscle tension and responsiveness to stretch stimuli facilitates gradual relaxation, relief of spasm, and improved stretch tolerance. The basic strain-counterstrain maneuver used for treatment of psoas RSI involves ﬂexion and gentle outward rotation of the hip while a dog is relaxed and lying on its side (Fig. 3). This technique is simple to perform, and when incorporated into an individualized home-program of daily exercise, can result in meaningful improvements in comfort level and mobility in an affected dog over time. Our understanding of whole-body adaptations to speciﬁc orthopedic ailments in the dog, and how these can lead to secondary syndromes of muscular pain and dysfunction is expanding. 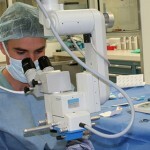 Many secondary problems respond well to simple and non-invasive manual treatments. Carefully designed programs of exercise and manual therapy can easily be incorporated into home programs, and can be extremely useful tools for long-term preservation of mobility and quality of life in our canine patients. Thank you for this article. I learned of this condition years ago through some colleagues who are trained in MTrP therapy, but did not know how to manage it myself since I am not trained to needle those, and there is no one near me who is. I look forward to giving this a try.